To make small changes to multimedia files, like cropping a video, eliminating part of it or extracting an audio thread, you don't need complex and expensive applications like Adobe Premiere. The majority of domestic users use VirtualDub. 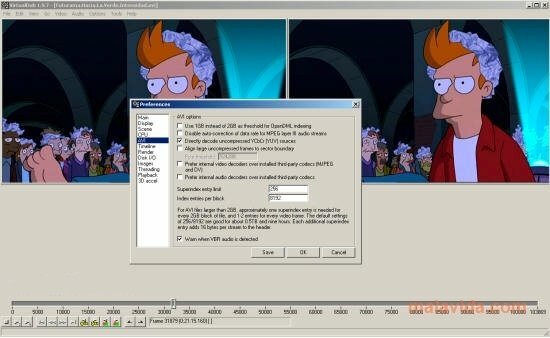 VirtualDub is a powerful multimedia editor that is totally free, that allows us to efficiently perform the basic editing tasks that any user may need, and furthermore, it offers us the possibility to obtain television captures if you have a TV tuner card. - Eliminate a fragment from a video. - Split or merge videos. - Code the video or audio threads. - Extract or eliminate an audio thread. To be able to apply small changes to your films, VirtualDub is undoubtedly one of the best options available.